One of the main selling points of the popular file cleaning software CCleaner is its extensibility. Instead of just having to live with the cleaning options that the software developers have integrated into their program, users can add custom locations to CCleaner that they want cleaned whenever the program is run. The basic idea behind CCEnhancer was to provide users with a collection of additional cleanup locations. This collection has grown to several hundred rule sets ever since the first version of the program was released by the developer. 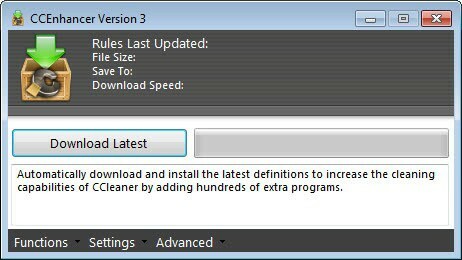 The program installs the rules into CCleaner which become available immediately afterwards in the program interface. CCEnhancer technically adds new definitions to CCleaner's winapp2.ini file, which contains all of the program's cleanup information. CCEnhancer installs the latest rule sets automatically if CCleaner has been installed on the target system. Users of the portable version may need to click on Settings > Portable Locations to add the portable paths in there for CCEnhancer to recognize them. The new version of the application comes with debugging capabilities. This basically checks the winapp2.ini file for errors which can be handy if the installation did not complete successfully, or if you are experiencing issues with CCleaner after installing the new rule sets. The developer of CCEnhancer has improved the program's detection mechanism and added capabilities to update multiple CCleaner versions simultaneously. That's useful for instance if one version of the program is installed on the computer, while a portable version is stored on a connected USB device. BleachBit users can now benefit from the rule sets of CCEnhancer as well, as the author has added support for the junk cleaner to the latest version of the program. Additional - minor - features have been added to the program. This includes a program interface that can be resized now, or an updated translation engine to better support additional interface languages. Interested users can download CCEnhancer 3.0 from the developer website over at SingularLabs. The program is compatible with all recent Microsoft Windows versions. This program doesn’t add meaningful descriptions of the new rulesets it adds. There are several sets that have an * character after their title but what does that mean? I have ended up removing useful features like the recently-used applications list and it’s not clear how I can reverse this. on win7 you can right-click the taskbar, select properties, select start menu and there you can check the box to show recently used programs. * means new addition from CCEnhancer to the original CCleaner list. CCleaner cleaning up after BleachBit? that it cleaned up after itself. Read closer. CCleaner does not do anything related to BleachBit: this article is about a third party application called CCEnhancer. For a while BleachBit has supported both its robust, XML-based CleanerML cleaner language as well as CCleaner’s simpler winapp2.ini language. So this article is about CCEnhancer updating winapp2.ini cleaner definitions for BleachBit. BleachBit already had an auto-update mechanism for winapp2.ini, but the updates are not as frequent. Also BleachBit had a mechanism for finding errors in CCleaner’s winapp2.ini files which led to some bug fixes upstream in winapp2.ini. IMO, BleachBit does a better job of cleaning up after itself than CCleaner. The BleachBit application does not store anything in the Windows registry, and it stores very little about usage (in the way of MRU and similar) in its .ini configuration. Also, unlike CCleaner, BleachBit provides an option to shred its own settings. Disclaimer: I am the author of BleachBit. Andrew thanks for clarifying the process. CCEnhancer adds rules to CCleaner. on those added rules and not CCEnhancer, correct? is it necessary of BleachBit cleans itself? Robert Palmar: The first part is right: CCEnhancer adds rules to CCleaner and now BleachBIt. The second part is not right: CCEnhancer and CCleaner do not clean BleachBit. Both CCLeaner and BleachBit store settings which some privacy-minded people do not like, so BleachBit makes it easy to clean its own settings. 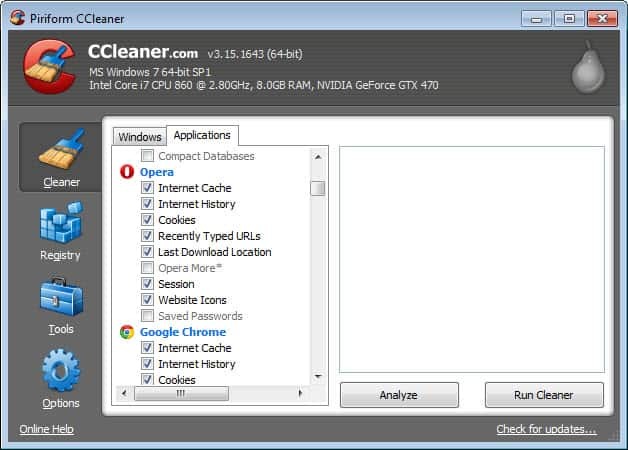 AFAIK, CCleaner does not clean its own settings, so someone could see what you were cleaning in CCleaner. Other people use BleachBit only to free disk space (not so much for privacy), so they do not want to clean these settings. It is more convenient NOT to clean the settings, so you don’t have to reconfigure the program. Thanks, Andrew. So it’s the settings. not concerned with “cleaning” any settings. I think the problematic word here is cleaning. I would categorize removing settings as deleting. Anyway, thanks for the clarification. And I’ll be sure to give BleachBit a try. What should I do? clean or defrag? No, do not use any of the Registry cleaning features in Ccleaner as it could cause some serious/permanent damage. I learned that the hard way, so now, I uncheck Everything pertaining to Registry cleaning and use Raxco Perfect Registry, which is safer and more effective! Conversely I have never had problems with CCleaner registry cleaning but as an extra precaution I always use it’s built in reg backup anyway. CCEnhancer is pretty good, as it adds items that I can choose to be cleaned. Only drawback is that it slows down the Analyze and cleaning process, which is not a big issue. Thanks I check it out. I am actually slow to DL updates because of the dreaded curse called Babylon. I have contracted (sic) it several times via legit downloads and must spend the rest of an hour just ridding myself of it. Can I get the Babylon, the curse of all helpful to a point of my going crazy, program!? If there is a chance then I do not want this or need this.